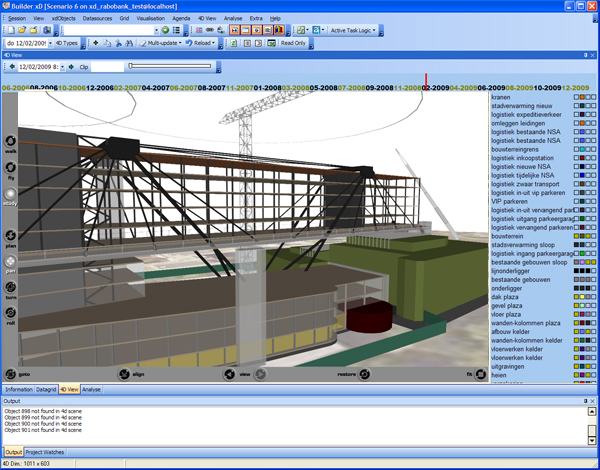 D-studio xD Virtual Builder is first of all a powerful time-based 4D/5D/xD visualization solution. Build around a SQL database it operates in C/S or stand-alone mode. 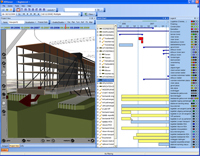 All relevant data –CAD, schedule, cost, …- is linked to xD Objects and dynamically synchronised with the original datasources, which facilitates continuous update. Multiple complex functions analyse and manage the project-model. Whereas reports and other output is generated automatically. 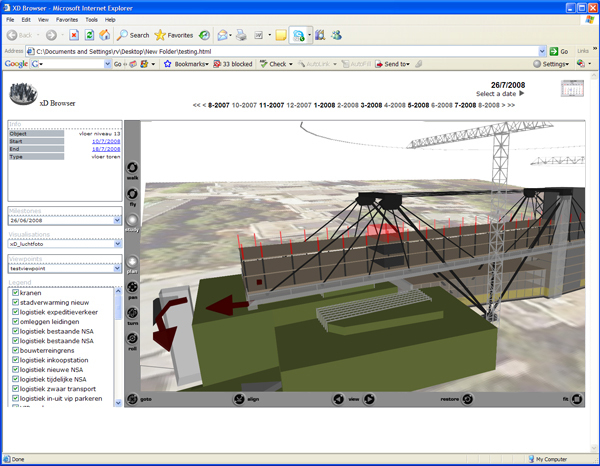 xD Project models can easily be shared on the Internet. It’s open and generative architecture opens up an endless scope of possible applications within the field of Building and Project Information models. It’s modular approach and intuitive user-interface serves every user’s need: whether it concerns planner, manager or client. And perhaps most important of all, the solution is based on real projects and real user’s needs. - you can coordinate the works: the different phases and teams are faultlessly tuned together. - you can efficiently communicate with all building partners: a well-organised and readable visualisation increases transparency. - you can anticipate problems and conflicts: prevention is better than cure. - you can quickly react to unexpected circumstances: project planning is effortlessly adapted. - you can balance the pros and cons of different project scenarios: you take the optimal decisions. - you create PowerPoint presentations / movies / image sets that are easily adapted: you always keep an overview. - you decide effectively, increase productivity of all staff members and reduce the costs of every building project. 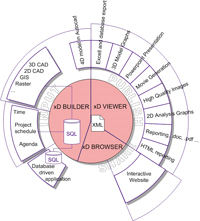 The xD Builder, in which the xD Project is constructed, the xD Viewer, which visualizes the xD Project and functions as a forum for all parties involved and as a quick analyzation and decision making tool and the xD Browser which opens the xD Project to all participants over the internet or local network. o project model in XML file. o analysis and conflict studies. o publish and share information. o share xD model on Intranet/Internet. o ready for embedding in corporate website. 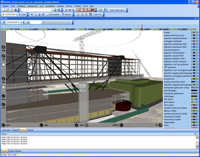 The xD Virtual Builderis developed especially for all partners in the building process who are concerned about quality,budget and planning of a project:the project manager,the property developer,investor,politician,safety coordinator or site manager,...,xD Virtual Builder is to everyone 's benefit. 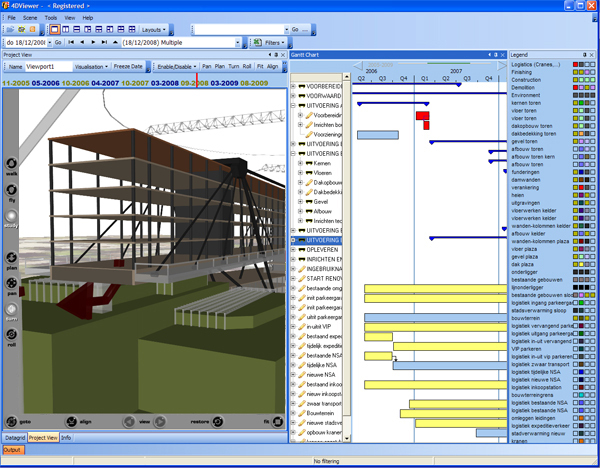 The xD Virtual Builder is the ideal software to track and evaluate the project resulting in the most efficient and interactive processflow. 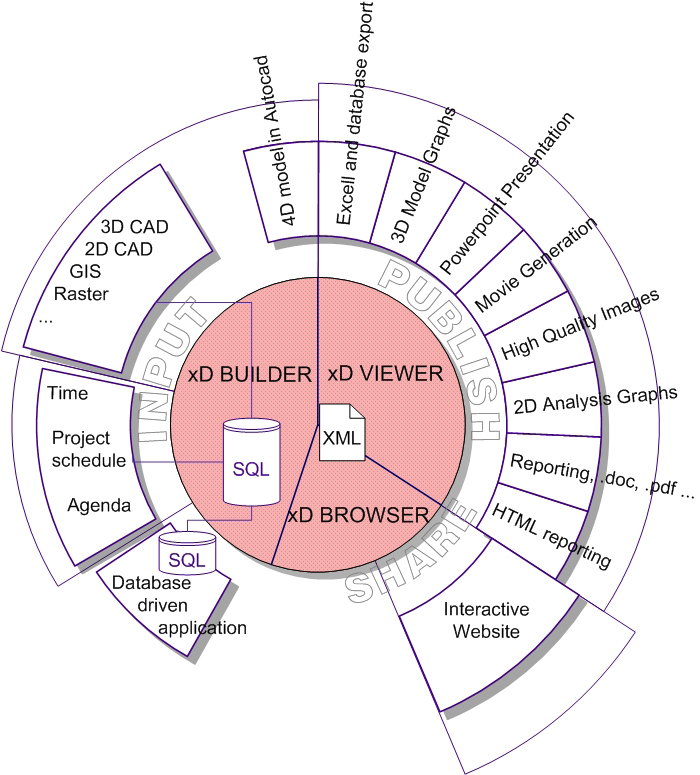 The tangle of factors of an urban development project is easily disentangled with the xD Virtual Builder. Communication with all parties involved (goverment, neighbourhood, contracters,...) becomes interactive, fast and clear and results in a better comprehension by all partners in the project. Provide a continious traffic or an efficient deviation of trains, busses, passengers, persons, cars and other vehicules during infrastructural works is made easy with the xD Virtual Builder. Check and compare all possible scenario's with all parties involved. For all these fields the xD Virtual Builder can be the most efficient way to schedule, evaluate, track and communicate the project process.